Business Week Launches Info Sharing Social Network – Will It Float? “Business Exchange, a free online information hub, is a new initiative of BusinessWeek.com. It enhances the ongoing reporting and analysis of Business Week writers and editors in print and online by aggregating other sources of news and analysis (including other media brands, blogs, videos, and research reports). Readers can use it to track business trends, with hundreds of topics available at launch, or create a specific topic that’s not currently on the Exchange. The best part is the social underpinning of this platform. Users (including our journalists and editors) can share their own knowledge about a subject to enrich each topic far beyond what any single person or search engine can accomplish. Bounce to the top – Adding a comment or a save doesn’t move an item to the top of the Business Exchange page for a given topic, losing that feeling of “what’s hot”. Forced segregation of content – For a given topic in Business Exchange, you can look at News or Blogs or References. But you can’t take them all in at once. View Saves by user – In the list of entries on Business Exchange, you can’t see how many times an item has been Saved. This information is available for an individual item. But it’s not an easy experience to see what others found valuable. As seen in this discussion, community, conversations, variety and outstanding design are making a difference for FriendFeed. That being said, Business Exchange is new and it’s beta. Let’s see what they are doing. The MyDebates post was “published” into the topic. The Soul of the Enterprise post was “added” to the topic. From what I can tell, designated media sites and blogs are automatically added based on either key words or tags. Full Profile. You get a full profile page on Business Exchange. Work, education, picture and up to four links to other sites. It also shows your recent activity, which is nice. Building a social network. You can’t search for other users. So you find them when they’re displayed as “Active Users” on the site, via the items they Save or Comments they make. It makes it a bit challenging to build out your list of subscriptions. Your subscriptions are simply a list, and you can click an individual to see their activity. There is not currently a way to see the aggregated activities only of your subscriptions. Focus on Most Active. 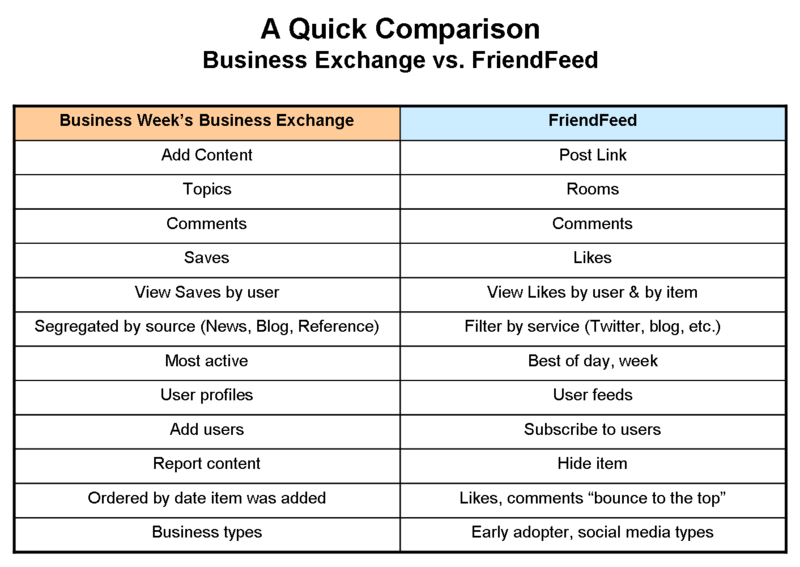 At different points on the site, Business Exchange gives a list of what’s most active. The home page tells you the most active Topics, and gives a list of Active Users. 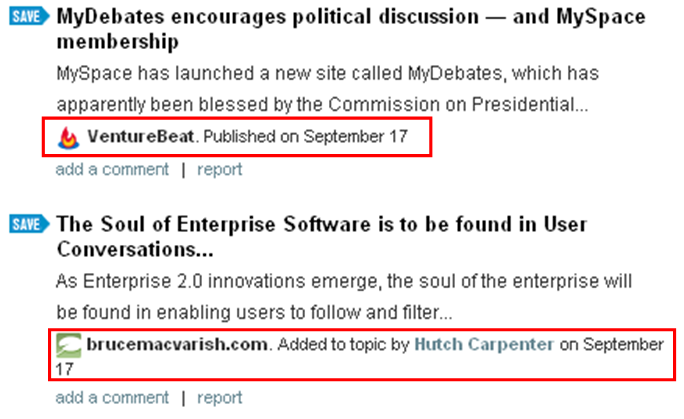 Each topic includes a list of Most Active, which does aggregate from News, Blogs and References. The definition of Most Active inside a topic is probably based on the number of Views, Saves and Comments. You can see all of those stats for an item when you go to make a Comment. I like seeing those stats. It’s early in the life of Business Exchange. Getting more users will, of course, make it a more interesting place to hang out. It doesn’t hurt that it hangs off the businessweek.com site, and that it can get periodic boosts from the print magazine. I’m still learning the site, and maybe the Most Active tab for each Topic is the place to be. My profile on Business Exchange is here. If you sign up, add me, and I’ll add you back.